Infrascape Design :- Hubbert’s Peaks | Dare I Call These People Alarmists? What is very horrifying to me is that he teaches his opinions to school children. I hope but have no confidence that he allows room for the brighter ones at least to develop their own opinions from the few facts that are available. You should join this club then. I’m not a scientist (nor do I claim to be one), but as a landscape architecture, the magnitude of environmental impacts/crisis caused by our society are very apparent. Even if all the fossilized carbon we’re spewing back into the atmosphere don’t make the world warmer, there a dozens of other planetary boundaries that the human species are transgressing which are easily noted by folks with a smidgen of ecological training. Since you ‘green-agenda’ calls for full discloser about the folks in the IPCC, what is your agenda and vested interest in denying ‘anthropogenic’ climate change? I’ll gladly share that I’m paid to teach students about designing sustainable cities. Even if you subtract climate change from why our cities need to reduce their environmental impact, there are too many other economic, cultural, and health reasons why I teach that subject. You claim to be an economist, so what are the unpaid costs of burning fossil fuels to power our society? Who pays for mercury poisoning, acid rain, smog, water pollution, cancers, piles of coal tailings and ash, and ground subsidence? You say you care about the personal impacts of mitigating ‘anthropogenic carbon’ – well what about the personal financial impacts of cleaning up after almost 2 centuries of coal mining and extracting oil from the earth? oh, your ‘unbiased analysis‘ proof that the world isn’t warming is backwards. I know New Zealand is upside down compared to the Northern Hemisphere, but I’m sorry that you lack the basic visual literacy to read a chart from either right-to-left or left-to-right. Happy to be labeled an ‘alarmist’ by you, but I’d rather be called a ‘citizen of the earth’. Let me comment on your answer if I may. Absolutely true and your answer makes it obvious that you have immediately cast me as a member of those who do not care about the environment. Sorry to inform you that that assumption is entirely incorrect. The planet has a myriad of needs brought upon by our abuse and I entirely agree that resources and peoples habits should be directed to correcting these problems that we have caused. But as you hint in your answer CHASING AFTER CO2 IS NOT ONE OF THOSE THINGS! Yes I am an economist, and so I suggest you think about how you will live when the cost of energy will become so high, maybe 50 or 100 fold, and (remembering we purchase energy when we buy food or any manufactured or transported object), that you will only be able to purchase a very small amount of it. That is if you have anything to purchase it with. You see the IPCC demands on emission controls and its proposed wealth transfers will have a worse effect on us than when we run out of fossil fuels. Now there are no easy answers here, but I don’t want to see my family starve just because the IPCC and an unproven hypothesis says there might be a chance of the world overheating because of us. Especially when the world has been this warm several times during recorded history. Also Barry, you appear to have intermingled several seperate issues. Anthropogenic Global warming is a seperate issue from human pollution of the environment, as it is a seperate issue from conservation of our resources. I am only talking about the first, the other issues I have as much concern as you. 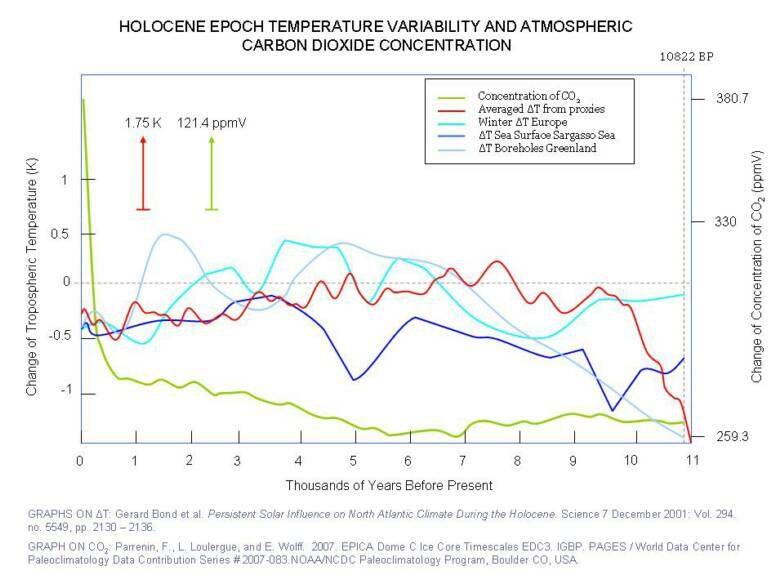 Especially concerning is the fact that if we chase after the life giving gas CO2, we will have fewer resources to remedy the other issues, which are absolutely real and not theories. Barry, this appears to be an ad hominem attack. Apart from that I have no idea what you are saying. Ad hominem attacks though, are usually precipitated when the attacker cannot address the issue and therefore resorts to abusing the messenger. I dont have to do that because I am secure in my understanding of the issues. I refered you to that website because it is an expose’ of how some of the people who are driving this unproven “anthropogenic CO2 causes global warming” think. I am different, I also have a concern for humanity. the number of game animals and the need to adjust the cull to the size of the surplus population.” or “If I were reincarnated I would wish to be returned to earth as a killer virus to lower human population levels.”, do you think he has any concern for mankind? I think you have labeled yourself as an alarmist quite accurately and I also think you should review your opinions on the welfare of humanity. As you will probably not be brave enough to publish this comment, dont worry, I will post this conversation at http://www.globalwarmingsupporter.wordpress.com where my readers will await your reply. Did you read my blog properly?